Here's mine with some minor changes once again. Guess most notable is the clock that replaced window titles. Other patches are just modifying behaviour. @ pks: do you mind share config.h, dwm.c and browser's config? It is, at least most locations in Berlin. You lived there? I don't mind at all. Take a look at my Repository. It will be hard to extract patches, though, as I didn't care for backwards compatibility. Anyway, each commit should more or less resemble a single feature. Just ask if you are interested in something specific. Here's my latest change with a modified tag bar so that the selected tag is dispayed with an overlining bar. Unfortunatly no. But I hope. For now I visited it many times and have fallen in love with it. Changed the statusbar colors to match my terminal colors, and trying out cure, it's is a nice little font! I think I got everything just the way I want now. 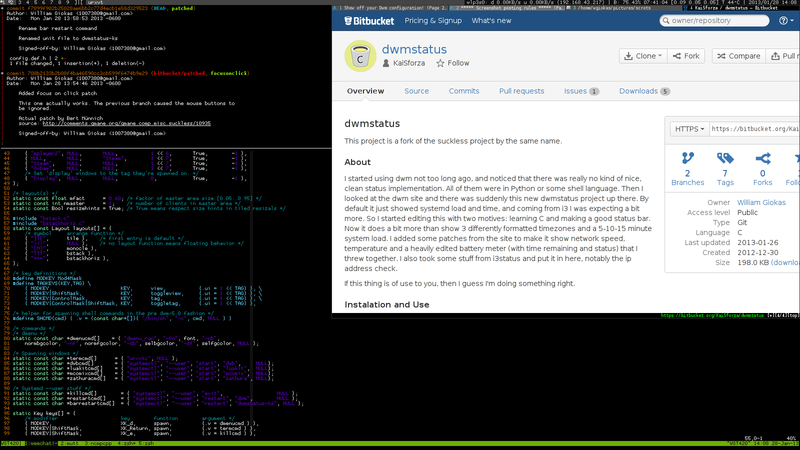 So as of last night at oh, 23:30 or so, I decided to switch from i3 to dwm. So far it's holding up nicely. The config is in my opinion nicer, and the recompiling is not a hassle at all if you know how to use makepkg. My dwm is all unpatched, and I don't (at the moment) see too much need for it. I hide the status bar most of the time as well. I've got a semi-custom status bar, thrown together from some selective patching of suckless' dwmstatus project. Also, running on systemd --user, so restarting on the fly is easy and non-destructive. A simple mod+shift+R after an update just flashes the bar and everything is brand new! I'll be putting the status stuff on my github soon enough. The config.h is already there in the pkgbuilds repo. cool config can you share the config files ? I have updated the set-up quite a lot, but it does have the same colour scheme. My configs are on my GitHub, but the're not completely up-to-date, yet. GUI: chromium, geany, skype, thunar, transmission, deadbeef, vlc, feh. CLI: urxvt, vim, irssi, ranger, moc. Lately I ran to dwm and try to show icons on statusbar, but failed T_T. but when I type "echo -e '\uE015'" on urxvt, it shows nothing. xsetroot -name "$(echo -e '\uE015')"
static const char font = "ohsnap:size=9:antialias=true:hinting=true" "," "-*-stlarch-medium-r-*-*-10-*-*-*-*-*-*-*"
Am I missing someting or doing something wrong ? delta_4d, this is a config sharing thread, not a troubleshooting thread. If you want to solve that, please start a new thread and provide *a lot* more information including which patches you have applied and whether other strings can be displayed in the status, whether that echo command works from a terminal within dwm, and where in your xinitrc that line is. Really sorry about it. I will start a new thread. From: where is it again?! Nice. Seems Connor has pulled his classic post on this topic, so yours is now the default! Your blog looks good too. I moved to dwm about a month ago from i3wm, and it uses the workspace concept, which I brought with me to dwm (used it pretty much the same way I used i3). After reading this I can see a while bunch of different ways to use dwm. Thanks! The statusbar is something I hacked together, and you can see the git repo of it in the screenshot. It's from a while ago, but it still applies cleanly. Most of the patches I've added are referenced in the git repo, otherwise you can just cherry-pick it to get what you need. I've learned more from your github then I'd like to say. I look forward to reading your blog. can you please share your ranger-config? didn't found it in your git-repo. Fight war not wars, destroy power not people! I've been a Awesome user for quite some time now. Just switched to dwm a few days ago and loving it so far. My set up is based on KieranQuinn's from above. What text editor is that? I also really like the color scheme in it.